Nightmares made real – Mantica’s most horrifying army burst onto the scene this week with the official release of the Nightstalkers! This faction offers some unique builds for your games of Kings of War and can be one of the most rewarding armies to play when done right. Let’s take a look at some of the tactical applications of these creatures on the tabletop and how you can lead your enemies straight into the void. There are two distinct army special rules that make the Nightstalkers stand out. The first is the Stealthy special rule. A large number of units in the army automatically come equipped with a built in -1 to hit modifier in shooting. Utilizing this along with cover provides a powerful defense against those pesky Elf bow shots. The second special rule is the ability, Mindthirst. This one turns traditional generalship on its head by stealing your opponent’s Inspiring sources. While they themselves can only benefit from a 6” or 9” range, you can steal the benefit from 12” out! This is definitely an incentive to get nice and close with your enemy. On top of that, you don’t have to spend points on inspiring sources! Nightstalkers boast a wide range of unit types. They are a diversified force with options for ranged attacks, speed, clever tricks, and brutal combat efficiency. Finding your unique approach is a task that is both challenging and rewarding. A wise general approaches battle with a strategy in mind. Something I highly recommend is focusing your force to do one thing really well. Luckily, with Nightstalkers you have a wealth of options. A grim, relentless force of Scarecrows, Butchers, Reapers, and a Terror or two make for an incredible hammer and anvil approach. Take a stout defensive position with Scarecrows and set up a nasty surge into the flank of an enemy that has failed to rout them. Let the wall of bodies distract the enemy while your brutally efficient ones take position to clean them up in one fell swoop. Perhaps you’d rather smother your opponent with ethereal flames and wicked lightning from beyond? The Nightstalkers Spectres and Mind-Screech in particular can lay down impressive firepower. Hitting on 4+ and stock piercing means you’re putting out some of the most potent ranged attacks in the game. Combine that with the likes of Screamers or Banshees with a Lightning Bolt upgrade and suddenly your force is punishing the enemy from afar very effectively. Maybe you’d rather get right into the thick of it. This strategy aims to make good use of the Mindthirst special rule by closing the gap with your opponent as quickly as possible. Flying Phantoms followed closely by Fiends and Shadowhounds mean that your force is made up entirely of speed 8-10 units. Add a real psychological threat with the use of the powerful Void Lurker who can also keep up with the force. Using this strategy, you must be careful that your units make the initial combats and then quickly overwhelm your foe! A more finesse approach involves clever application of special rules rather than brute force to win your games. 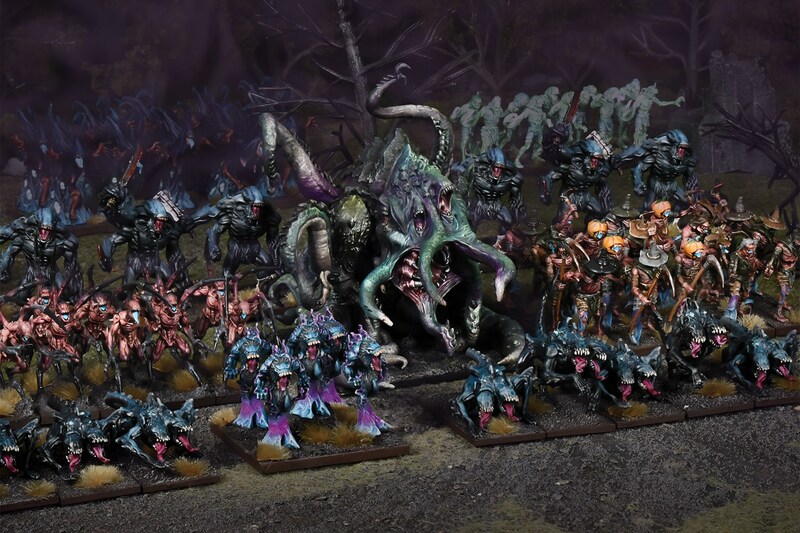 The Clash of Kings 2019 supplement adds additional units and rules to a Nightstalker army as well as some amazing formations. By combining the Grim Harvest Formation and a Reaper Souldrinker hero, you can push three units up to Lifeleech 3 or higher! Not only will your army be grinding away, they’ll be rejuvenating themselves as they go. Also available is the Butchers’ Block formation. This gives two hordes of Butchers and a Shadow Hulk the Brutal special rule. Cleverly combine that with a Portal of Despair (looking at you TerrainCrate) and suddenly you’re modifying your opponent’s nerve by 2! That brave regiment of Knights with 15/17 nerve will be reduced to a measly 13/15 instead. Now we’re talking real fear tactics. Lastly, consider the tools available to the army. Multiple units carry the Windblast special rule allowing you to dictate late game decisions. Flying a Banshee into position on the final turn to wail an opponent off an objective and securing the game in your favor is precisely the flavor of this faction. Pull off tricks such as laying the firepower of Spectres or a Mind-Screech into a unit and then Surge a shambling unit like Scarecrows in to add additional damage in the same turn and lock them down. This army rewards the creative and the bold. It can be challenging to master but will always be an absolute blast to play. They can spoil the plans of even the most experienced general with a wide array of tricks and tools. If you think you’re brave enough to delve into this nightmarish faction, know this: You are only limited by your imagination. The post Nightstalker: Battle Tactics appeared first on Mantic Blog.